A comparison of the U.S. Drought Monitor to last year for about the same time (Figures 2 and 3), indicates much improved drought conditions across Wyoming and South Dakota. 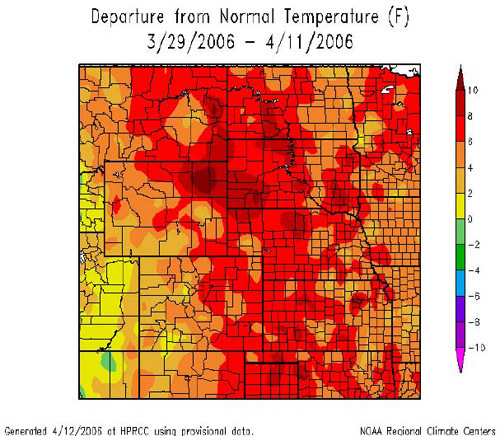 In March of 2005, “Extreme” to “Exceptional” drought conditions was noted over Wyoming and western South Dakota. However, precipitation trends over the last 12 months have resulted in improved drought conditions for that area with indices in the “Moderate” category. Elsewhere, drought conditions have eased from “Severe” to “Moderate” over Nebraska from a year ago, but have worsened from “Abnormally Dry” to “Moderate” across eastern Colorado and Kansas. Some improvement from “Moderate” to “Abnormally Dry” occurred over western Colorado. 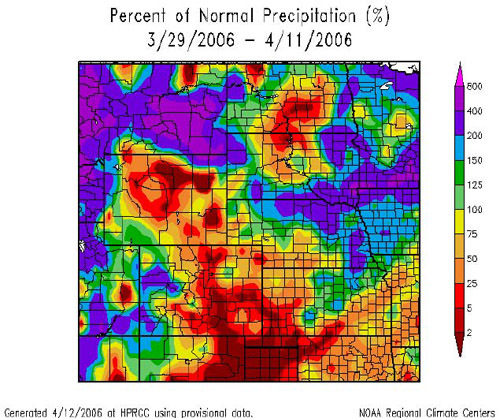 Figures 4 and 5 show drought conditions for the end of March 2004 and 2003, respectively. Figure 2. 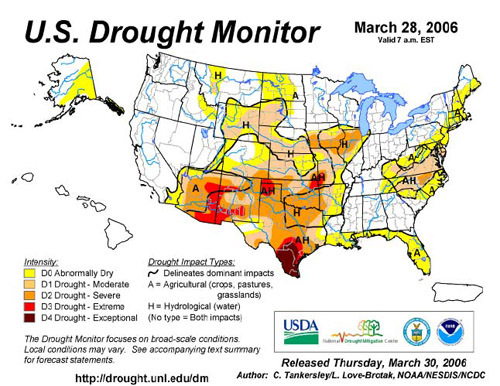 Drought Monitor for March 28, 2006. Figure 3. 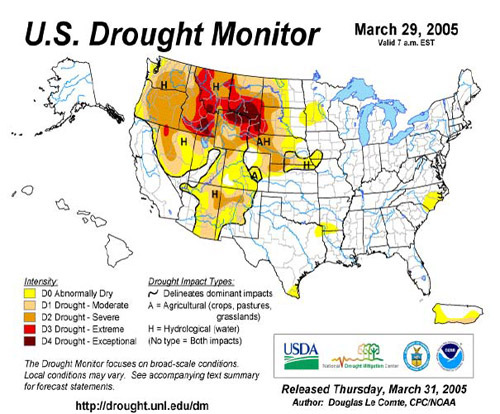 Drought Monitor for March 29, 2005. Figure 4. 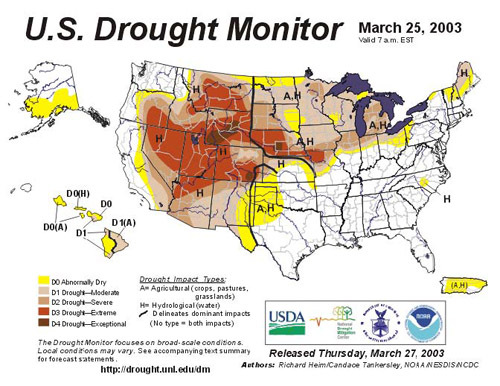 Drought Monitor for March 30, 2004. Figure 5. 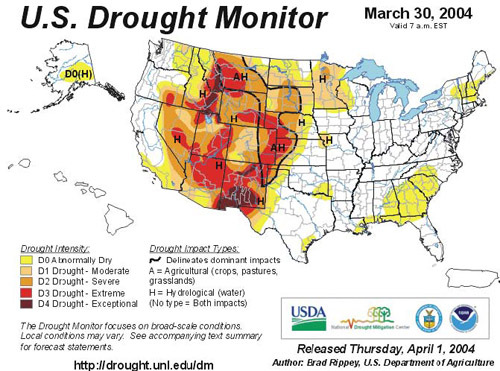 Drought Monitor for March 25, 2003. Winter weather patterns brought above average snowpack to portions of the Rocky Mountain Area (Figures 6 thru 11), including the northern and central mountains of Colorado, and western and southern Wyoming mountains, near average snowpack to the Black Hills, and northern San Juan’s of Colorado, and below average snowpack to the southern San Juan’s, Rio Grand Area of Colorado, and entire Front Range of Colorado generally below 9,000 feet. Figure 7. 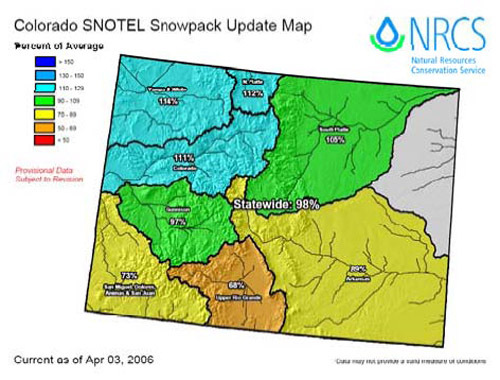 Colorado SNOTEL percent of average basin snowpack as of April 3, 2006. Figure 8. 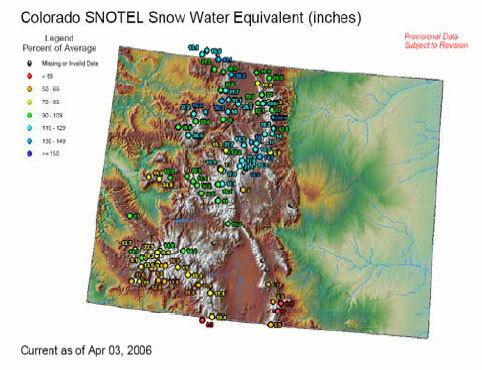 Colorado SNOTEL snow water equivalent as of April 3, 2006. Figure 10. 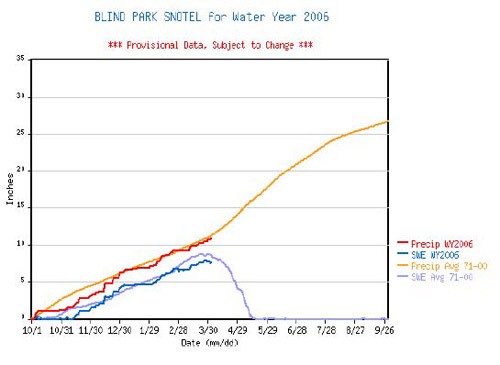 Blind Park SNOTEL for water year 2006. Percent of average snow water equivalent as of April 3, 2006. Figure 11. 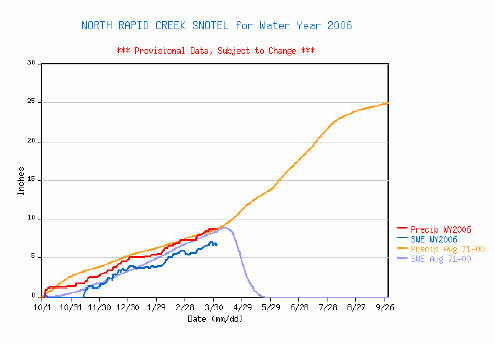 North Rapid Creek SNOTEL for water year 2006. 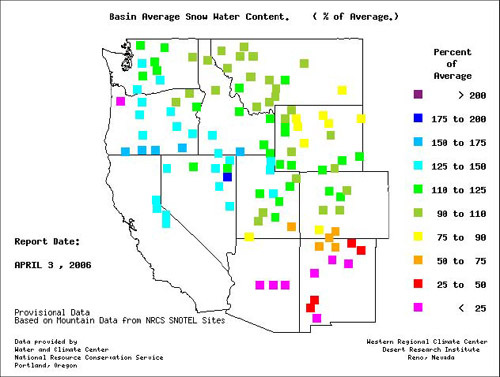 Percent of average snow water equivalent as of April 3, 2006. 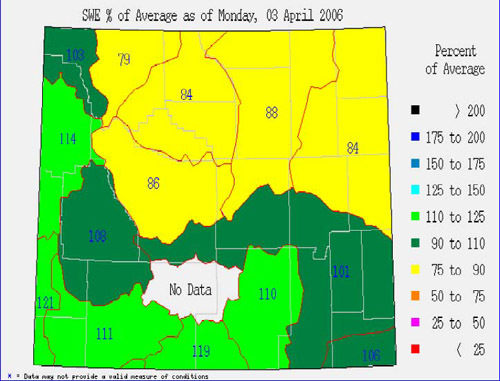 Figure 12 shows percent of average precipitation for the RMA for a 2-week period ending April 11, 2006. As indicated by the graphic, percent of average precipitation is 25%- 50% across portions of eastern Colorado, southeast/central Wyoming, western Kansas, and central South Dakota. 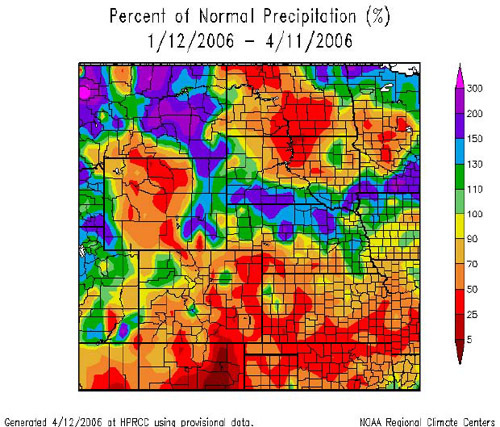 Figure 13, 90-day percent of normal precipitation ending April 11, 2006, shows similar conditions. 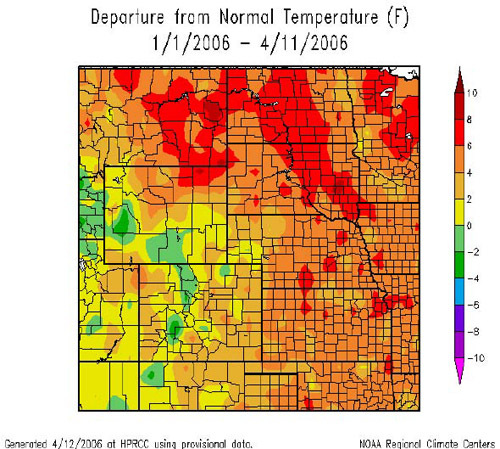 Departure from normal temperature for the last two weeks (Figure 14) and since January 1, 2006 (Figure 15), show temperature departures above average across much of the Rocky Mountain Area, illustrated by the widespread orange and red colors. The only exception to this is over the northern and central mountains of Colorado and portions of southern and western Wyoming. These areas have received above average snowfall, which has resulted in slightly cooler than average temperatures. Current ENSO (El Nino Southern Oscillation-Figure 16) indices indicate weak La Nina (cold episode) conditions in the Eastern Tropical Pacific. Weak to moderate La Nina conditions have impacted weather patterns (resulting in warm and dry) across portions of the southern and central Rocky Mountains during the past several months, but to a lesser degree over the northern Rockies (Wyoming and Black Hills region). 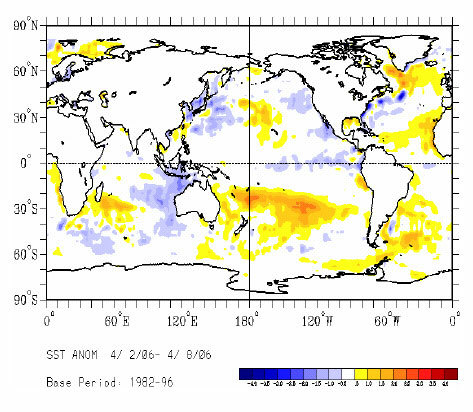 Current NAO (North Atlantic Oscillations-Figure 17) anomalies are negative in the northern Atlantic. Negative NAO anomalies may have impact on North American spring and summer climate; including the Rocky Mountains (refer to the Climate and Weather Outlooks Section). Figure 17. 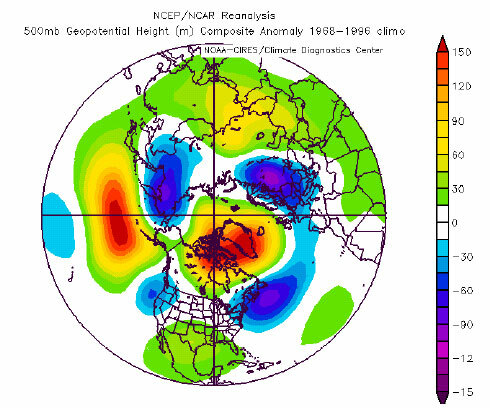 500 mb Height Composite Anomaly from 1968-1996.